The Gambler’s Choice is back! 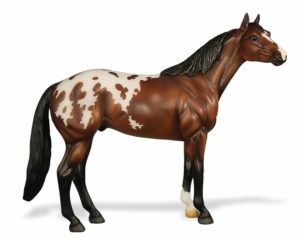 Distinguished by a white spotted blanket, Calvin comes in chestnut, bay, and metallic interference blue! There are 500 of each color, and colors will be randomly selected for you. Each piece is beautifully shaded and makes a lovely Appaloosa. Enjoy the surprise! Limit one (1) model per Collector Club member, while supplies last. Purchase must be completed by 11:59pm EDT on 10/23/17. *Note: Offer available to valid, current Collector Club members in good standing only, while supplies last. 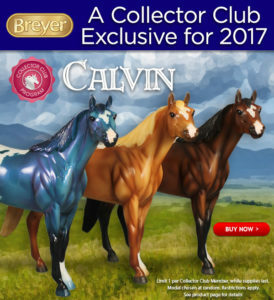 Any remaining models which have not been purchased by Collector Club members may be sold to general consumers on BreyerHorses.com. Calvin is excluded from all discounts, promotional codes, sales, and/or special offers at this time. I happily ordered my Calvin along with a Goblin. I can’t wait to see them both in person! Which color Calvin is your favorite?